The life of a Lipizzaner stallion is not all pirouettes and gala evenings. 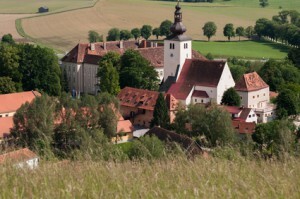 And it begins far from the Viennese crowds in the rural idyll that is the Piber stud farm in Styria (pictured). A week after the birth, the mare and foal return to the main breeding herd. Six months later, all that season’s young foals are separated from the mothers and form their own herd. And another six months later, the male foals join the colt herd, where they remain for another 2 to 3 years. During these early years, the horses are under constant observation and supervision, and also enjoy the summer months roaming “free” on alpine pastures. This social and physical environment allows the horses to develop those skills they’ll need later if they’re to make it as performance stallions: build, stamina, dexterity etc. For more info on the early years of the stallions, see the Piber website. The very best (about six each year) transfer to Vienna, where they enter a training program which lasts up to eight years before the stallions are considered suitable for public performances. Each horse has its own specialty – so it’s trained for a specific move. Though a horse might work with apprentices and senior riders, each has its own designated (student) rider and the two form a lifelong partnership. For more on the training program, see the Spanish Riding School website. In the summer they get a holiday in the country at Heldenberg, Lower Austria. Retirement age is about 25, and because of their fitness, genetics and healthy upbringing, the stallions may live until 35.